Women in today's world prefer men who have a beard as they feel that it makes them look sexier. We all see and know that, a beard can transform a guy into a man and make them look more matured and hotter. This applies with Bollywood stars as well and the 'salt and pepper' look has been famous within the older lot of actors in Bollywood. 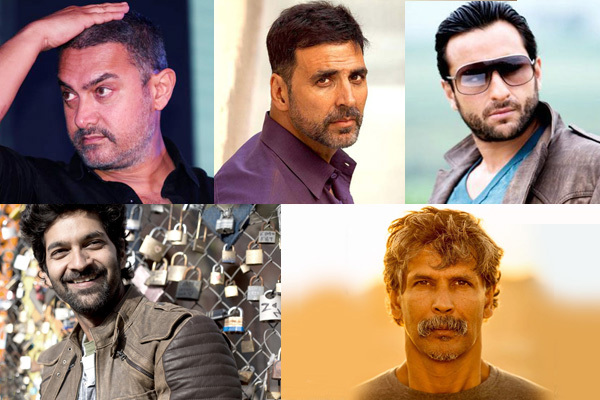 Let's have a look at these five actors who have set the salt and pepper look to another standard. Purab Kohli - This hot hunk made his debut first on television after which he reached heights. We saw him earlier without stubble in which we found him really hot but the stubble look of his is a killer making everyone go mad over him. He will soon be seen in 'Rock On 2' sporting his beard look. Saif Ali Khan - The Nawab of Bollywood was every girls dream and the most admired guy. Since the time he has started sporting his stubble look he has made all girls go made over him and stolen the heart of one of the hottest actresses from Kapoor family Kareena Kapoor with his hot beard. Akshay Kumar - Khiladi Kumar of Bollywood always known for his strict fitness regime and fitness shocked everyone with his Salt and Pepper look from his movie 'Airlift'. There are no second thought on it that he really looked liked the hottest hunk from his lot of actors. Amir Khan - Mr perfectionist of the industry is always known for experimenting with his roles and looks. But none of his looks could compete with his stubble look. He has never looked hotter in any of his looks as in his beard. Milind Soman - Finally we have, the hottest model in the industry breaking all the records of hottest by sporting his hot as ever beard look. Milind being a model has always sported all his looks sexily but his stubble look has no competition.